I know what you’re thinking…the Pepper at the gates of Fort Ben? A saucerful of Press The Glass? You betcha! Press The Glass will be at Pepper’s Brew Garden and Eatery on 56th St., Friday October 14th at 10pm. I know, I know, it’s a few weeks away, but now that we’re getting back to our regular tour schedule around Indianapolis, we really want to pack the house for this one! So put it on your calendar, and also check out the Facebook event page at https://www.facebook.com/events/312084159152887/ and let us know you’re coming. 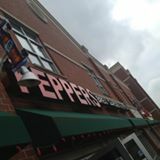 You can also check out Pepper’s on Facebook at https://www.facebook.com/peppersfort/.